I chose a muted palette from this painting – I think I’m in a muted mood today. Would you like to see a 2nd post (after my vacation!) based on this painting, with more vivid colors? The First Core of Four is designed to give you two tops and two “bottoms” (I don’t know why, but lots of people are completely bothered by the term bottoms…) that can be worn as four outfits. It’s the most simple and high-mileage combination of neutral clothes you can find, and it makes a great base upon which to build your wardrobe. A second Core of Four (another four blue-on-blue outfits), now gives you sixteen different combinations! (4 x 4 = 16). Yes, these outfits aren’t the cutting edge of trendy fashion, but they’re certainly acceptable and appropriate pretty much anywhere you can wear jeans, and if you love these colors, they’ll be outfits that make you happy. sweater – Steven Alan, dark wash jeans – A.P.C. Woman does not live by clothing alone – you’ve got to at least wear shoes! The role of integration is to give you a sense of coherence in your outfits. 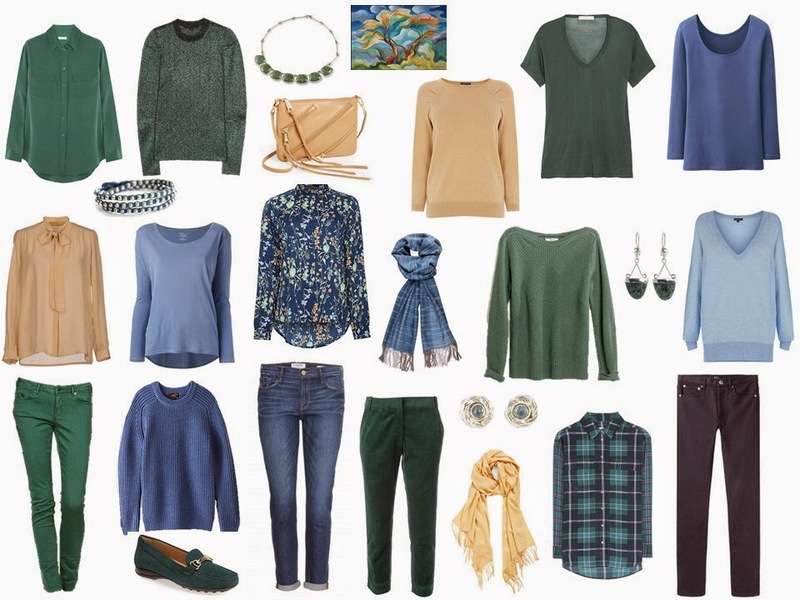 For example, if you wore a green sweater with blue jeans, it would all hang together if you were also wearing a blue scarf that picked up the color of the jeans. In the original 4 by 4 wardrobes, I used only 4 items to Integrate the Wardrobe. Those wardrobe were for hot weather, and were very minimal – we were really pulling together the very least necessary for a beach vacation or similar activities. Since then, I’ve surrendered to my longing for accessories and expanded the number, but you could certainly get by with just a couple of pairs of shoes, a bag, and one scarf, or one pair of earrings. Always remember – the choices are yours, and nobody else’s! good idea to show the flip side of this fashion combo – showing the lighter, brighter & bolder colors within the same painting as your inspiration . . . as usual your selections are amazing ! This is beautiful but I lean toward more vivid color so I would love to see this painting done again. I am loving this shade of green though. Thank you for the clarification on the groupings. I love your color combinations. I'd love to see denim and dark camel as the neutrals with warm accent colors sometime! Thanks for all your amazing work. Have a lovely vacation! I enjoyed reading about how you put together the 4×4. Makes it much clearer to me. Thank You! You are amazing….that was perfect….and so quickly done! This will be a huge help for my daughter who is rethinking her wardrobe as she "grows up" into her 40's and sheds some of her young mom clothes. Thank you. Thanks so much for the greater detail of explanation. I have been revamping my wardrobe over the last several months and just now have several items I am deciding about for Fall/Winter. I have been using your 24-piece Wardrobe as a template for the overhaul. I can't afford to buy everything that size wardrobe calls for in one season (and don't really want to — save something for next year, right? ), so it was so helpful to me to plug items I'm considering into this Core of Four Wardrobe template. These are the things I need *first* — the rest will be fun to add on later. I have always dressed in a mix-and-match way, but your work has really taught me the value and necessity of accessories to really pull my looks together. This particular post drives that idea home again. Thanks! Janice, yes to the brighter colors. Olive skin tone here who loves the palette today, but cannot wear the soft yellow or olive green. Yes to the vivid colors, though muted tones are my personal preference. It's an education to see you do both sets. When I first started reading your column (almost two years ago now), I pared down my wardrobe considerably. You convinced me to do so. But Janice, LOL, you make it soooooooo HARD to stay pared down. Every day you tempt me with some wonderful color combination and I find myself thinking, "Ooooh, I could wear that!" But, no. Slap on wrist. I'm sticking with discipline. In fact, striving for even more discipline!!! Athough, I could wear that muted mossy green…..
Janice, I follow your daily posts even before coffee, and that takes true dedication ! I love, love, love all that I am learning from you, especially the Starting from Scratch series and now the various 4×4 s. However –I'm curious how you arrive at your selection of individual piece styles within a group each piece should be different, but in some core groups you include a cardigan, and in others that becomes a pullover sweater. I'm a formula person and am wondering about your thinking on each individual piece. Please keep up this fantastic blog, it makes my day ! Thank you so much for the clarification.I analyse your posts every day but the main rules are very usefull. I see the accessories play a very important role however I still find it difficult to choose the right colours of the scarf (one colour,two colours ore more,neutral colours or accent colours) or other accessories.I will be very thankfull if you could shortly explain the main principles.Thank you once more for wonderful daily posts! I would also love to see this with a warmer neutral and bright accents. Love the magic that you do! I love the colours! Muted and medium contrast!Beautiful! A beautiful collection, as usual. There are lots of fairly plain clothes but combined together and with the accessories I think you'd look quietly stylish every day. Janice, this is lovely, as always! I have a picture I would like to send you for consideration as a "Start With Art" possibility, but I cannot find an email address here on the blog. Would you mind providing one? And my apologies if it's here in plain sight! Send it to theviviennefiles@gmail.com. I'd love to see it! Ah, thank you! I had already tried janice@theviviennefiles.com and got rejected . . . . but I thought it was nice try! Ha!